With all the mega decisions you have to make during the wedding planning period (planning an epic hen party being one of them), little things like finding the perfect wedding shoes can get pushed to the side. However, actually finding shoes you love and feel great in is a lot easier when you have a guide to go by. With this said, we’ve thrown together all the elements you need to remember when finding the perfect wedding shoes for you. Before or After the Dress? This mainly depends on which one you find more important, and most of the time people think the dress is more important than the shoes are. In this case, a lot of women pick their dream dress and then find a pair of shoes to co-ordinate with them. Whatever you do, don’t linger on this decision for too long and stress yourself out. Most of the time, you’ll already have the style of your whole outfit in your head and be able to put together the outfit accordingly, no matter what you start on. Along the way, most brides to be have the battle of comfort vs. style when it comes to what they’re wearing on the big day. Firstly, you should definitely go for a heel height that you’re used to or is lower than you usually wear – no higher otherwise you’ll find yourself stumbling and falling all day. Keep in mind that you’ll be wearing these shows for over 12 hours (if you don’t kick them off for the dancing) and you need have some form of comfor­tability. Also, consider the length of your wedding dress, and whether this means your heel needs to be higher to stop the dress dragging, or lower so the dress hem falls correctly. Make sure you wear both together before your special day, you don’t want to be tripping over your long train as the photographer snaps a picture! When you're thinking about wedding shoes, people instantly jump to the colour white. This clean, traditional colour makes deciding a lot easier for you because you can focus on the style and height. However, don’t feel like you’re put in a box and HAVE to choose white or any shade of cream. Have you forgotten about your something blue? Throw some pretty turquoise shoes on and make your wedding outfit a bit different. 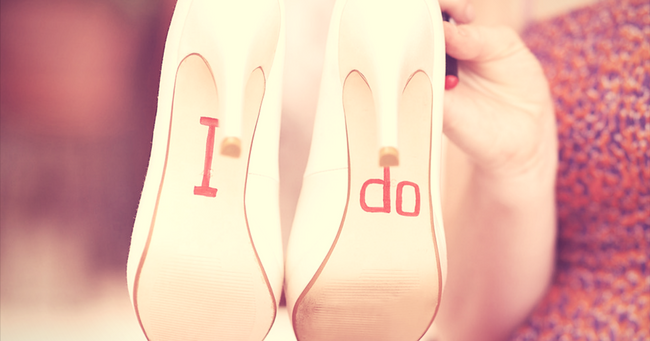 A lot of brides also choose a shoe colour to fit their wedding colour palette. Obviously, when it gets to your wedding day you want your shoes to look brand new, shiny and wow the guests and your new hubby. However, no wearing your shoes in could introduce a whole world of pain for your poor feet. Think back to the first time you wore your new pair of heels on a night out and had to go home after the third drink – never again, right? We suggest wearing in your shoes a few times so they fit your foot shape better on the day.